At Financial Aims we follow an advice process with all our clients. This enables us to base our advice on your circumstances and goals. At our first meeting we will typically carry out a review of your current financial circumstances and discuss your goals and areas of advice that are important to you. This also gives you an opportunity to meet our adviser. We will gather information known as 'factfinding' to start building a picture of your needs. This is where we find out what's important to you and what areas of advice you want to address such as Protection, Borrowing, Investing, Retirement etc. We will also discuss your attitude to investment risk and help you understand how investments interact with risk together with your feelings towards any potential capital loss. It's important you disclose all information so we can work together and build a suitable financial plan for you. 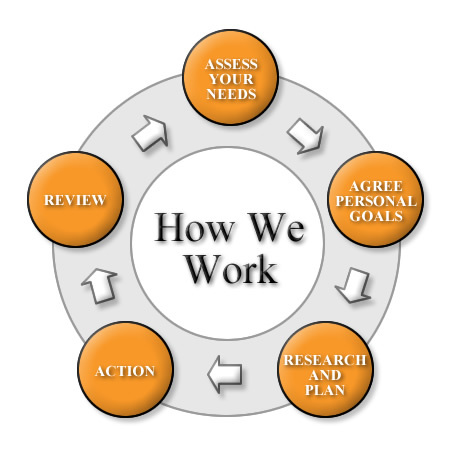 It's important to review plans on a regular basis to ensure the solutions continue to meet your needs and objectives. Often goals and circumstances can change. We normally offer an annual review services although intervals can be more regular than this if required. Once we have gathered all the information required we will arrange a further appointment to allow us time to research the best solution for you. We will typically produce a financial planning report explaining our findings and suggested action to address your goals. The next stage is to carry out the agreed action. This includes completing applications and liaising with the relevant providers to set up and implement plans and investments. It's important to review plans on a regular basis to ensure the solutions still meet your needs. Often goals and circumstances can change. We normally offer an annaul review services although intervals can be more regular than this if required.